When it comes to preserving the natural landscape of the area, the development at Alta Sierra was built with this in mind. So much so that the community has the distinction of being one of only 531 Audubon certified Cooperative Sanctuaries in the world. Because of that, residents enjoy not only the amazing beauty that envelopes Alta Sierra but they also get to enjoy the rare native wildlife that call this spot of land in the Sierra foothills home. Year round the natural migration of the geese, ducks, and other avian creatures is spectacular for birdwatchers to catch a glimpse of the rarer species right from their back porches. Deer are well protected as they sip from the many natural and manmade ponds around the community. The people of Alta Sierra have embraced their duties as stewards of these grounds by building animal habitats within the community for the birds. With all that there is to love about living in Alta Sierra, for those at or nearing retirement age, the 18-hole golf course is reason enough to set up residence at Alta Sierra. The semi-private Alta Sierra Country Club is more than a great place to golf. The wetlands and wildlife sanctuary that is Alta Sierra is the perfect place to enjoy nature while playing a few rounds of golf. It’s a good idea to bring a pair of binoculars or a camera with you on the greens. You never know what interesting wildlife you will see on the course. 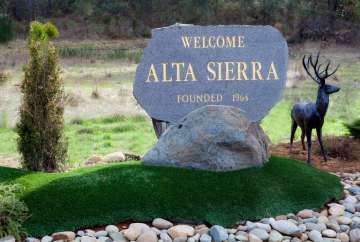 Alta Sierra offers quiet living for the nearly 7K residents. The population is made up of people of all different ages with just over 21% who are 18 are younger, 20% are millennials, 30% are between 45 and 64 years old, and just under 25% are 65 and up. On average, household incomes in Alta Sierra are close to $60K per year with less than 5% of the population living in poverty. Kids go to middle school and high school either in the Grass Valley school district to the north or the Pleasant Ridge schools. However Alta Sierra has its own elementary school that offers Pre-K through 5th grade. This school located within the community has an excellent rating and provides parents with a place to send their kids after school with many after school programs for kids working parents. Beyond the community this small community has everything you need to enjoy a quiet existence. There is a hair salon, a local gym, a wine tasting shop, restaurants, and more. When it comes to finding real estate in Alta Sierra, Kathy Papola knows the best properties in the area. Home prices range from the low $200Ks up to just under a million. Whether you are looking for a small 1,400 square foot cabin or a large three bedroom, two bath home situated over acres and acres of land, you can find it in Alta Sierra. Like many towns in this part of California, there is a very interesting history that dates back to the gold rush. Many of the homes there also reflect the lifestyles of the early settlers. Homes built in the style of rustic cabins to estates nestled amidst the sky stretching trees make up much of the real estate in Alta Sierra. While the outside of these homes harken back to days of yesterday, many of the homes have been thoroughly updated for today’s modern conveniences. You can even find condos listed in the high $200ks to the low $300Ks high in this mountain town. Compared to the rest of California, the cost of living is not bad and the home prices reflect that, making it an affordable option for retirees and vacation home seekers. No matter if you are relocating to Alta Sierra with your family, retiring, or looking for a nice quiet vacation or second home, Alta Sierra is the place for you. If you were to dream up a location that is away from the beaten path, small enough to afford a peaceful existence, and that has a front row seat to some of nature’s most beautiful features, you might just dream of Alta Sierra. It is just what the doctor ordered for city weary travelers who would like to just breathe the fresh air and look at the stars blanketing the clear night sky. Sound good to you? Of course it does and Kathy Papola can help you find a home that is just right for you. Are you thinking about settling down in Alta Sierra? If so, you can contact Kathy Papola for more information.